You may be hearing the word “disruptive” a lot these days. It’s a buzzword in many industries, and can mean different things to different people. It all revolves around giving the people exactly what they want, and that is often done by turning things on their head. 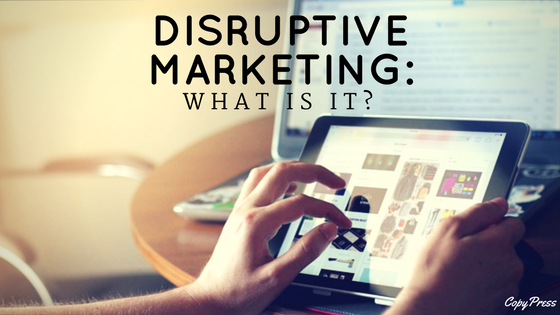 Let’s take a look at disruptive marketing’s roots, some great real world examples, and how you can apply this tactic to your business. Before disruptive marketing started to take shape, disruption started elsewhere, in innovation. This concept has been around for a much longer time than disruptive marketing. Disruptive innovation is a term coined by Harvard professor Clayton Christensen in 1997, though the actual process has been around much longer. It is defined in the Harvard Business Review as “a process whereby a smaller company with fewer resources is able to successfully challenge established incumbent businesses.” They overtake the market, succeed, and become the new world order. As you can see, disruptive innovation is everywhere. With technology becoming more and more advanced, we’ll see some incredible innovations happen before our eyes. Just think about Netflix and what that did to the movie and cable industries. Think about telemedicine and what that’s going to do to the health industry. Disruptive innovation happens before our eyes every day. Disruptive innovations make things accessible. They take things that only a certain segment of the population could attain, and find a way to distribute it to the masses. So, what does this have to do with disruptive marketing? Well, disruptive marketing uses the same idea, where it takes something people used to do, and approaches it differently. Brands that use disruptive marketing take everything they knew about traditional marketing and threw it out with the bath water. Brands used marketing in a more unapproachable way, but these days, the consumers want to be a part of the conversation. They want access. Disruptive marketing gives them that access. It connects consumers with brands on a more human level. Reviewing some real world examples of disruptive marketing helps solidify the understanding of it. Brands have used this so effectively that it’s completely shifted the world’s perception of them. It has taken brands from laughed at to coveted. That’s some powerful stuff. Disruptive marketing gets people’s attention by being different and taking risks. It embraces concepts that are outside of the norm. It even sometimes has some shock value. That’s the factor that forces people to stop and look. It innovates. Not only does it encourage people to think about things differently, it analyzes data that might not normally be given the time of day. Disruptive marketing can take a simple, everyday something with not much excitement, and make it engaging and unique and something the consumer needs. It makes them want to be a part of that story and take part in what the brand has to offer. One of the greatest things about disruptive marketing is that it’s unique to a brand. It’s so different that if any other brand tries to market itself in the exact same way as the original brand using that marketing, they’ll be dismissed. They’ll be considered copycats and ignored. Disruptive marketing sets your company up as an individual brand with a specific image that no one else can duplicate. Brands embracing disruptive marketing, no matter the type of product they’re selling, have been largely successful. Here are some great examples of disruptive marketing in the real world, and what it’s done for those businesses. Nike ran an ad campaign on YouTube called “Better For It.” The series of videos followed adopted sisters Margot and Lily. Margot and Lily are very different. One of them loves to workout, with a YouTube channel and a large following. The other hates working out and has a different viewpoint when it comes to fitness. The girls get into a competition. The goal for Nike’s campaign was to be relatable. Most women can see themselves in either Margot or Lily. Nike was very successful. It showed that it was a brand not just for intense athletes dedicated to fitness, but also for those who don’t necessarily love breaking a sweat. This isn’t disruptive because of the video aspect. Plenty of brands have done that. However, what does make it disruptive is that it doesn’t aggressively push its products, it gives a realistic portrayal of those who struggle with finding the motivation to work out, and it’s incredibly relatable. Women can easily put themselves in either of those pairs of Nikes. HBO ran an ad campaign to feature its HBO Go platform, where HBO subscribers can take the service wherever they go by allowing them to login from different devices. Instead of going the obvious “Go” route by touting advantages of having your favorite shows and hit movies with you whether you’re in a hotel, on the train, or in a plane, HBO did some disruptive marketing. They found a less obvious, but still quite needed, use for the service and went there instead. Car companies aren’t typically known for their humor (unless you particularly enjoyed Kia’s hamsters campaign), however, Toyota turned down that comedic lane in a very unexpected way, by talking about cars fueled by bullsh*t.
It’s worth noting that many brands that use curse words in their campaigns unexpectedly typically have a high rate of virality (Think the “ship my pants” ads from Kmart). Toyota takes this a step further. While the cars aren’t filled by actual bullsh*t, they do show a scientist and dairy farmer working together to show that manure can be turned into car fuel. The ad ends with “We are driving down the road, running on bullsh*t.” A big automotive company using curse words playfully and making light of itself isn’t something you see every day. A list of brands using disruptive marketing tactics wouldn’t be complete without mentioning Air Wick’s incredible Scent Decorator. This is what we were talking about when we mentioned something so small and simple turning into something so engaging. Air Wick, the air freshener company, made a simple, beautiful quiz to help readers figure out which scent fits your home décor and mood. After you take the quiz, you get décor tips tailored to you, the perfect scent for you, and a handy how-to guide for some DIY home projects. Something as seemingly insignificant as an air freshener is given so much more power by being tied in with the overall mood and décor of your home. You don’t expect something so interactive and engaging from an air freshener company, and that’s what makes it disruptive. One of the biggest underlying trends you can find in disruptive marketing is that it attempts to engage with and relate to the consumer. In order to have a successful disruptive campaign, you need to start with stepping into the consumer’s shoes. What do they need? What do they want? How do they spend their days? Refine your audience. Make your target specific. Thinking outside the box is crucial. Now that you have considered the needs of your audience as they pertain to your business, how can you reach them on a different level? What won’t they expect? How can they use your product in a way they didn’t think they could before? What makes it a bigger part of their day? What will make them think of your brand as human? With so many genius campaigns out there, it can be tempting to follow a similar format to something that’s been done. However, you need to be unique. Don’t be afraid to take risks. No risk, no reward. Go guerilla. Create something that forces your audience to feel a strong emotion, whether it’s anger or fear or sadness or awkwardness. Whether you’ve got a team of creative minds able to work on an unexpected idea or if you hire a highly rated marketing firm, you’ll find there are plenty of rewards to reap when you incorporate this type of marketing. With so many brands realizing the power of social engagement and the need for a human element, we’re only going to see disruptive marketing grow and evolve. Who knows, maybe your brand could be the next big thing everyone’s talking about.